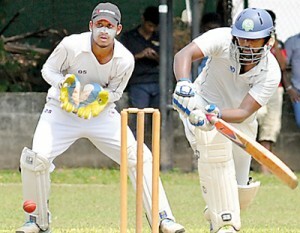 A partnership of 70-runs for the 5th wicket in 61 balls between Saman Fernando (76 in 65 balls, two sixes and eight boundaries) and Nimanda Subasinghe (46 in 40 balls, four hits over the ropes and four to the ropes), gave Pan Asia Banking Corporation a thrilling two wicket win over McLarens Group in the Final of the 5th Prestige Automobile (Pvt) Ltd. sponsored, , ‘BMW –Hyundai’ Cup, MCA ‘C’ division 50 Over League tournament 2016 concluded at the MCA Grounds. After in-form opener PABC Thusitha Silva’s early exit on their chase of a victory target of 258 Chamika Sansaka (28) and Kanishka Prashan (42) did a quick road repair putting 45 runs for the 2nd wicket. PABC’s run chase went on smoothly until Nimanda Subasinghe’s departure at 214 and the game swung towards McLarens, with the board reading at 238 for 7 in the 46th over. The pendulum swung once again for PABC when Randika Fernando bowling his last over gave away nine runs 249 for 7. But Randika Fernando made amends by taking a brilliant catch at point to get rid of Viraj Deepal (15 in 25 balls) off skipper, Tharinda Rukshan (251 for 8 in 48 overs), Leaving, skipper Buddhika de Alwis and Savindra Amaradasa to survive the final charge by McLarens. Earlier on, McLarens who won the toss and chose to bat on a green top, put up a challenging 257 for 8 in 50 overs, their inning anchored by opener, Mahel Gerome (80 in 117 balls inclusive of a six and six fours) and Sandaruwan Hettiarachchi (63 in 75 balls, hitting eight fours). McLarens bat deep and it was the two PABC right arm medium paces’ Anju Perera (10-1-45-4) and Savindra Amaradasa (10-0-46-3) that kept them at bay. PABC’s Saman Fernando was named man-of-the-match.